The Goo Goo Dolls are an American rock band formed in 1986 in Buffalo, New York, by vocalist and guitarist John Rzeznik, vocalist and bassist Robby Takac, and drummer George Tutuska. Mike Malinin was the band's drummer from January 1995 until December 27, 2013 (but not made an official member until 1998). Although renowned for their commercially successful 1998 single "Iris", they have had several other notable and popular singles including "Name" and "Naked" from 1995's A Boy Named Goo. "Slide", "Black Balloon", "Dizzy", and "Broadway" from 1998's Dizzy Up the Girl, "Here Is Gone" from 2002's Gutterflower, "Better Days", "Give a Little Bit", and "Stay with You" from 2006's Let Love In (although "Give A Little Bit" was originally released on the 2004 live CD/DVD album Live in Buffalo: July 4th, 2004), and "Home" from 2010's Something for the Rest of Us. The Goo Goo Dolls have had 19 top ten singles on various charts, and have sold more than 12 million albums worldwide. In October 2012, "Iris" was ranked #1 on Billboard's "Top 100 Pop Songs 1992–2012" chart, which also featured Goo Goo Dolls hits "Slide", ranking at #9, and "Name" at #24. Their biggest hit, "Iris", from the City of Angels soundtrack (and later Dizzy Up the Girl), spent nearly 12 straight months on the Billboard charts and held the number one position on the Hot 100 Airplay chart for 18 weeks. The first single from their 2010 album, Something for the Rest of Us, "Home", extended the band's record to 14 top ten hits at the hot AC radio format (more than any other artist in the history of that format). The band's tenth album, Magnetic, was released on June 11, 2013. On May 6, 2016, their eleventh studio album, Boxes, was released. 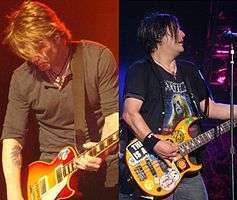 The band's original lineup included John Rzeznik (vocals, guitar), Robby Takac (vocals, bass), and George Tutuska (drums, percussion). Takac and Tutuska had been long-time friends in school and met Rzeznik while he was playing in the band The Beaumonts with Takac's cousin, Paul Takac. The trio picked their name from a True Detective ad for a toy called a Goo Goo Doll. "We were young and we were a garage band not trying to get a deal. We had a gig that night and needed a name. It's the best we came up with, and for some reason it stuck. If I had five more minutes, I definitely would have picked a better name", John stated. With Takac as their lead singer, the band released their first album, Goo Goo Dolls in 1987 on Mercenary Records, but was picked up in 1988 by Celluloid Records, a larger record company. They played around Buffalo's underground music circuit opening for punk bands such as SNFU, Dag Nasty, ALL, The Dead Milkmen, Gang Green, Doughboys, and DRI and playing with fellow Buffalo bands. The band released its second album Jed in 1989. The band released its third album, Hold Me Up, in 1990 and featured Rzeznik as the lead vocalist on five tracks, including the single, "There You Are"—as well as their then concert favorite, "Two Days in February". After being embraced by local college radio and punk scenes (including playing such venues as CBGB), the Goo Goo Dolls' third release incorporated elements of heavy metal, pop rock, and punk rock. In 1991, the song "I'm Awake Now" was recorded for the soundtrack of Freddy's Dead: The Final Nightmare. Superstar Car Wash, released in 1993, received significant media attention. The critical success and encouraging sales of their last album resulted in a larger budget from Metal Blade Records. The album was partially recorded at Metalworks Studios in Mississauga, Ontario. "We Are the Normal" (the single for which Rzeznik asked frontman Paul Westerberg of The Replacements to write the lyrics) received a major push toward play on college and independent radio, while its video was displayed on MTV's 120 Minutes program. "Fallin' Down" made it onto the 1993 soundtrack of Pauly Shore's hit film Son in Law. Shortly after recording the band's fifth album A Boy Named Goo, Tutuska was kicked out of the band. The band moved forward from this December 31, 1994 incident, hiring Mike Malinin, and toured rigorously. A Boy Named Goo had a catchy rock sound, and became one of the most successful alternative rock albums of the mid-1990s. It sold modestly in this time; however, it was not until the release of the single "Name" that the band experienced any viable commercial success. A Boy Named Goo became the first album in Metal Blade history to achieve double-platinum status. This success, however, proved bittersweet, as the band found themselves in a legal battle with Metal Blade records. The band filed suit against Metal Blade, claiming they had not earned any royalties from their album's sales, which was attributed to a "grossly unfair, one-sided and unenforceable contract" which had been signed by the band in 1987. The two sides reached a settlement which had the band signed to the Metal Blade's distributing label, Warner Bros. Records, under which the band released their sixth album, Dizzy Up the Girl, in 1998. The undisputed success of "Name" marked a fundamental change in the band's sound from alternative rock to a more mainstream "adult orientated rock" (AOR) direction which disappointed many of the original fans of the band. It was "Name" that had made the band popular and they were able to make guest appearances on Beverly Hills, 90210, Charmed, and even presented an award to Michael Jackson. Rzeznik was approached to write a song for the City of Angels soundtrack, and the end product was "Iris". This song propelled the band to stardom, as it stayed on top of Billboard Hot 100 Airplay charts for a record-breaking 18 weeks and spent 4 weeks at No. 1 on Billboard's Pop Songs chart. Later that year, it was nominated for three Grammys. According to several interviews with Rzeznik, he was experiencing serious bouts of writer's block when he was approached, and was on the verge of quitting the band days before he wrote the song. "Iris" was included on the triple-platinum Dizzy Up the Girl, and was among top-ten hits "Slide", "Black Balloon", "Broadway", and "Dizzy" from the same album. In 2001, the Goos released their first ever compilation CD, What I Learned About Ego, Opinion, Art & Commerce. Next, Gutterflower (2002) achieved gold certification, producing the hits "Here Is Gone", "Sympathy", and "Big Machine". On July 4, 2004, the band performed a free concert in their hometown of Buffalo, continuing through a deluge of rain that can be seen on the DVD released later that year. The DVD also contained a studio version of the Goo Goo Dolls' cover of "Give a Little Bit" by Supertramp. The single reached the top of the Adult Top 40 chart in 2005. July 4, 2004 has been proclaimed "Goo Goo Dolls Day" in their native Buffalo, New York. Goo Goo Dolls perform their song "Before It's Too Late" from the OST of the 2007 film Transformers at the Tweeter Center in Mansfield, Massachusetts, on July 22, 2007. In 2006, the Goo Goo Dolls marked their 20th anniversary with their new album Let Love In, which included the studio recording of "Give a Little Bit" as well as other top 10 radio singles "Better Days", "Stay with You", and "Let Love In". With their third consecutive single ("Let Love In") from the album, the Goo Goo Dolls hit a record 12 top 10 hits in Adult Top 40 history, beating Matchbox Twenty and Sheryl Crow until Matchbox Twenty's release of Exile on Mainstream and the Goo Goo Dolls' release of "Before It's Too Late" from the Transformers Soundtrack, which left both groups with 13 top 10 hits in the Adult Top 40. Goo Goo Dolls planned to release another single from Let Love In, "Without You Here", as well as a song from the July 2007 Transformers movie called "Before It's Too Late", originally titled "Fiction". To promote the new single, the Goo Goo Dolls performed "Before It's Too Late" at both The Tonight Show with Jay Leno on June 8, 2007, and again at The Late Late Show with Craig Ferguson on June 22, 2007. In July 2007 the band discussed their career as a whole and gave a live performance on A&E's Private Sessions. Rzeznik stated that after the release of "Without You Here" and their summer tour with Lifehouse and Colbie Caillat, the band would return to the studio to begin work on their next album, their ninth overall. The song "Better Days" was used in the trailer for the 2009 film Love Happens. It was also used in the pilot episode of the CBS TV show, Jericho and in a promo for WGRZ aired during Super Bowl XLVI. On November 13, 2007, the Goo Goo Dolls released a greatest hits album entitled Greatest Hits Volume One: The Singles, which includes a new version of "Name" recorded and mixed by Paul David Hager, and a remix of "Feel the Silence" by Michael Brauer. On August 19, 2008, a second greatest hits album was released entitled Vol.2, which includes b-sides, rarities, and a live performance at Red Rocks Amphitheatre from their "Let Love In" tour. The Goo Goo Dolls announced recording sessions for a new album, on their official website, unrelated to their Volume Two in 2008. In addition, the band performed as part of the O2 Wireless Festival in London's Hyde Park in the summer of 2008, at the Miller Lite Rock 'N Racing show at the Indianapolis Motor Speedway during qualifying for the 2008 Allstate 400 at the Brickyard NASCAR Sprint Cup Series race, as well as performing a four-show tour across England. On June 19, 2008 at a ceremony in New York City, the band's singer and principal songwriter John Rzeznik was named that year's recipient of the Hal David Starlight Songwriter Award. Past recipients of the prestigious award include: Rob Thomas, Alicia Keys, John Mayer and John Legend. On June 12, 2009, the band mentioned on their Facebook page that the producer for their new album was Tim Palmer. On August 15, 2009, Robby Takac posted an update on his Twitter account stating that the recording for the new album had been completed, and the mixing of the album was yet to be done. Then on September 18, 2009, John Rzeznik stated in an interview on Good Day L.A., that the new album had tentatively been titled Something for the Rest of Us. Something for the Rest of Us was released on August 31, 2010. While the album was full of the pop-rock that has sustained the band for decades, lead singer/guitarist Rzeznik's songwriting took on a more somber, serious tone. The band performed a live mini concert at the Apple Store in Manhattan, New York on December 2, 2010. The show was recorded and was released in 2011 as a part of Apple's "Live at SoHo" collection which is sold online at the iTunes Store. On January 3, 2011, the band performed the halftime show at the Orange Bowl played between the Stanford Cardinal and the Virginia Tech Hokies. On January 30, 2011, they performed before the start of the Pro Bowl in Hawaii. On February 7, 2011 they performed at the Delta Ballroom in St. John's Newfoundland, beginning their 2011 Canadian tour. During an interview with UpVenue on February 16, 2011, Rzeznik confirmed that he was writing new material for a new album: "I've actually been experimenting, in this last week, while we've been out on this tour, just writing lyrics and then figuring out the melodic structures", said Rzeznik. "We can't wait another four years to put another album out; that's just a ridiculous waste of time." On May 23, 2011, it was announced that the band had recorded a song for the 2011 film Transformers: Dark of the Moon called "All That You Are", and was released on the film's soundtrack on June 14, 2011. In September 2011, "Iris" reached the number three spot in the Top 40 in the UK, 13 years after its original release. On August 9, 2012, the band announced that they had started recording their tenth studio album. The new album, titled Magnetic, was recorded using multiple producers. On January 18, 2013, the band released the first single off of Magnetic titled "Rebel Beat". Magnetic was released on June 11, 2013  and debuted at #8 on the Billboard Top 200 Albums chart. On July 19, 2013 the band released the second single off of Magnetic, "Come to Me". The band supported the album with a co-headlining tour with Matchbox Twenty, a Canadian tour, an acoustic tour with support from Run River North, and a co-headlining tour with Daughtry. On December 27, 2013, Malinin announced his departure from the band via Twitter and Facebook. The Goo Goo Dolls contributed to the soundtrack of the broadway musical Finding Neverland in 2015. The soundtrack, released June 9, 2015, contained the song "If the World Turned Upside Down." The band spent the majority of 2015 in the studio writing and recording their eleventh studio album, Boxes, at Bear Creek Studio in Woodinville, Washington. Robby Takac revealed that there were eleven tracks, two of which were songs he sang lead vocals on, and that three out of eleven tracks were already completed. The album was released on May 6, 2016. The Goo Goo Dolls celebrated the 20th anniversary of the release of A Boy Named Goo by releasing a special edition of the album on November 27, 2015. The special edition contains the original track listing of the album, along with seven unreleased tracks. In addition, Dizzy Up the Girl and A Boy Named Goo were released for the first time on vinyl on October 8 and November 27, respectively. On February 22, 2016 the band announced a summer tour with Collective Soul and Tribe Society to promote Boxes. The Goo Goo Dolls have been closely involved with several charities over the years. Through the organization USA Harvest, millions of meals have been distributed to people in need by generous fans bringing nonperishable goods to the band's concerts over the course of more than a decade. A scholarship fund was created by the band for St. Joseph's Collegiate Institute in honor of Nicholas Orrange, John Rzeznik's nephew. It is a high school with higher academic requirements. The purpose of this scholarship is to aid people who carry the grades but cannot afford the school, which is considered one of the finest college preparatory programs in the Western New York area. Over the years the Goo Goo Dolls have also been involved with the Food Bank of Western NY and Compass House. The band has also volunteered their time to perform at events for ECHO, Light of Day, among others. They have lent a hand for causes from Autism research, to scholastic musical programs as well as participating and donating to innumerable other charities. John Rzeznik is an ambassador for VH1's Save the Music Foundation. Robby Takac is the founder of the Music is Art Foundation. 1 2 Huey, Steve. "Goo Goo Dolls". AllMusic. Retrieved July 30, 2015. ↑ Stevenson, Jane (June 28, 2013). "Goo Goo Dolls, Matchbox Twenty put on crowd-pleasing Amphitheatre show". Toronto Sun. Retrieved July 30, 2015. ↑ Jonze, Tim (July 9, 2009). "The surprise hit of the download era". The Guardian. Retrieved July 30, 2015. ↑ Unterberger, Andrew. "Top Ten Mediocre Post-Grunge / Alternative Bands". Stylus Magazine. Retrieved July 30, 2015. ↑ Magnarella, Patrick. "Goo Goo Fans – Biography". GooGooFans.com. GooGooFans. Archived from the original on 16 December 2014. Retrieved 8 November 2016. ↑ "Goo Goo Dolls Break Own Record for Most Top 10 Singles on Billboard/BDS Adult Top 40 Chart". marketwired.com (Press release). Warner Bros. 5 October 2010. Retrieved 8 November 2016. ↑ Trust, Gary (3 October 2012). "The Top 100 Pop Songs 1992-2012, From No. 100 To No. 1 - Chart Beat". billboard.com. Billboard (magazine). Retrieved 8 November 2016. 1 2 "GOO GOO DOLLS: New Album Magnetic Available May 7th". googoodolls.com. Goo Goo Dolls. 22 January 2013. Archived from the original on 2 March 2013. Retrieved 8 November 2016. ↑ Morano, Scott (1996). "Goo Goo Dolls FAQ". musicfanclubs.org. Music Fan Clubs. Retrieved 8 November 2016. ↑ Rolling Stone, November 1999. ↑ Taylor, B. Kimberly (1996). "Goo Goo Dolls Biography". Contemporary Musicians. Thomson Gale. Archived from the original on 20 November 2006. Retrieved 8 November 2016. ↑ "Goo Goo Dolls Want Label to Forget Their Name". rollingstone.com. Rolling Stone. 2 December 1996. Archived from the original on 12 October 2007. Retrieved 8 November 2016. ↑ "Goo Goo Dolls Lawsuit Coming to a Head". rollingstone.com. Rolling Stone. 12 April 1997. Archived from the original on 2 October 2007. Retrieved 8 November 2016. ↑ Lovelady, Lyndsey (6 September 2010). "Multi Platinum Man: An Interview With Goo Goo Dolls' Johnny Rzeznik". American Songwriter. American Songwriter. Retrieved 8 November 2016. ↑ Gomez, Luis (8 July 2013). "Interview: Backstage party with Goo Goo Dolls singer John Rzeznik". articles.chicagotribune.com/. Chicago Tribune. Retrieved 8 November 2016. ↑ Naidenov, Eugeny (30 April 2007). "Goo Goo Dolls Transforming Experience?". ultimate-guitar.com. Archived from the original on 6 July 2007. Retrieved 8 November 2016. ↑ Luce, Patrick (19 February 2007). "The Goo Goo Dolls set for CD/DVD version of 'Let Love In' and world tour". monstersandcritics.com. Monsters and Critics. Archived from the original on 1 February 2014. Retrieved 8 November 2016. ↑ "Goo Goo Dolls to Release First-Ever Greatest Hits CD". marketwired.com. Warner Bros. 23 August 2007. Retrieved 8 November 2016. ↑ "Goo Goo Dolls Team with NFL & United Way in Detroit Lions' Thanksgiving Halftime Show". marketwired.com. Warner Bros. 16 November 2007. Retrieved 8 November 2016. ↑ "The Goo Goo Dolls". www.googoodolls.com. 2008. Retrieved February 9, 2008. ↑ Fletcher, Alex (12 March 2008). "Goo Goo Dolls Join O2 Wireless Bill". digitalspy.com. Digital Spy. Retrieved 9 November 2016. ↑ Kelly, Paul (30 April 2008). "Miller Lite Rock 'N Racing Show July 26". indianapolismotorspeedway.com. Indianapolis Motor Speedway. Archived from the original on 15 July 2008. Retrieved 9 November 2016. ↑ "Goo Goo Dolls Facebook". facebook.com. Facebook. Retrieved 8 November 2016. ↑ Takac, Robby. "Robby Takac (RobbyTakac) on Twitter". Twitter.com. Retrieved May 12, 2010. ↑ Video from:Good Day LA (October 31, 2009). "Goo Goo Dolls' John Rzeznik on GDLA | FOX 11 News". Myfoxla.com. Archived from the original on July 15, 2010. Retrieved May 12, 2010. ↑ "John Rzeznik – Twitter". John Rzeznik. May 31, 2010. Archived from the original on January 21, 2010. Retrieved May 31, 2010. ↑ Donahue, Ann (23 July 2010). "Goo Goo Dolls Had Fun 'Blowing Things Up' on New Album, Says Frontman". Billboard.com. Billboard (magazine). Retrieved 9 November 2016. ↑ "Apple In Store Announced". googoodolls.com. Goo Goo Dolls. 25 November 2010. Archived from the original on 13 March 2012. Retrieved 9 November 2016. ↑ Terry (17 February 2014). "Goo Goo Dolls Interview". upvenue.com. UpVenue. Retrieved 9 November 2016. ↑ "Recording!". Goo Goo Dolls. August 9, 2012. Retrieved August 9, 2012. ↑ "Goo Goo Dolls (googoodolls) on Twitter". Twitter.com. January 19, 2013. Retrieved January 20, 2013. ↑ Sarah (19 July 2013). "New Single – 'Come To Me' – Goo Goo Dolls Official Blog". Googoodolls.com. Goo Goo Dolls. Retrieved 9 November 2016. ↑ Etina (6 December 2013). "Canadian Tour Announced! – Goo Goo Dolls Official Blog". Googoodolls.com. Goo Goo Dolls. Retrieved 9 November 2016. ↑ Etina (23 January 2014). "Acoustic Tour Dates Announced! – Goo Goo Dolls Official Blog". Googoodolls.com. Goo Goo Dolls. Retrieved 9 November 2016. ↑ Etina (10 March 2014). "Goo Goo Dolls and Daughtry Summer Tour – Goo Goo Dolls Official Blog". Googoodolls.com. Goo Goo Dolls. Retrieved 9 November 2016. ↑ Malinin, Mike (27 December 2013). "Twitter / mikemalinin: Got some news today. Just wanted". Twitter.com. Twitter. Archived from the original on 5 January 2016. Retrieved 9 November 2016. ↑ Malinin, Mike (27 December 2013). "Mike Malinin – Got some news today. Just wanted to say...". facebook.com. Facebook. Archived from the original on 28 December 2013. Retrieved 9 November 2016. ↑ "Finding Neverland: The Album (Songs from the Broadway Musical) by Various Artists on iTunes". Itunes.apple.com. iTunes. 9 June 2015. Retrieved 9 November 2016. ↑ "The Goo Goo Dolls – A Boy Named Goo (20th Anniversary Edition) – Amazon.com Music". Amazon.com. Retrieved 2015-11-23. ↑ "Goo Goo Dolls – Warner Bros. Records". Store.warnermusic.com. Warner Bros. Retrieved 9 November 2016. ↑ Etina (22 February 2016). "The Goo Goo Dolls Announce North American Summer Headline Tour!". googoodolls.com. Goo Goo Dolls. Retrieved 9 November 2016. 1 2 "Twitter / GooGooFans: FYI: The @googoodolls currently". Twitter.com. 2014-02-16. Retrieved 2014-04-18. ↑ Dave Schulz was the member of the band that appeared on Taxicab Confessions Archived September 19, 2009, at the Wayback Machine. "Before It's Too Late (Sam and Mikaela's Theme)"